1) I'm using 1mm speaker cable I bought from Game to hook up the speakers. Very cheap cable. Would investing in thicker cables matter, especially for the music I run stereo through the fronts. This question applies to a random AV cable I'm using to hook up the sub... would that matter too? 2) I've started using FLAC files for my music and buying audio cds which I play through my Sony bluray player. Ive read online that a dedicated CD player like a NAD reproduces sound better than DVD/bluray players... how true is this? Is it enough of a difference to invest in a second hand CD player? The reason I'm asking these questions are because I dont want to spend money on something I don't need but I also don't want to rob myself of the best listening experience I can get with my current setup. The room acoustics aren't the best (hollow wooden floors) so I know I can't get the best experience (yet). But would these factors play a role? And is the sub sufficient for the diamond 8 setup? I found this site on how to arrive at the voltage a speaker "requires" ( folks, please correct me here as I know very little about electronics etc....just learning as I go along ) Would I be wrong is saying the voltage at the speaker would be around 2 or 3 volts while listening ?? If I can get that figure then the app where one can feed in the wattage, distance and voltage, it will calculate the cable thickness needed for that volume with a cable distance of whatever. 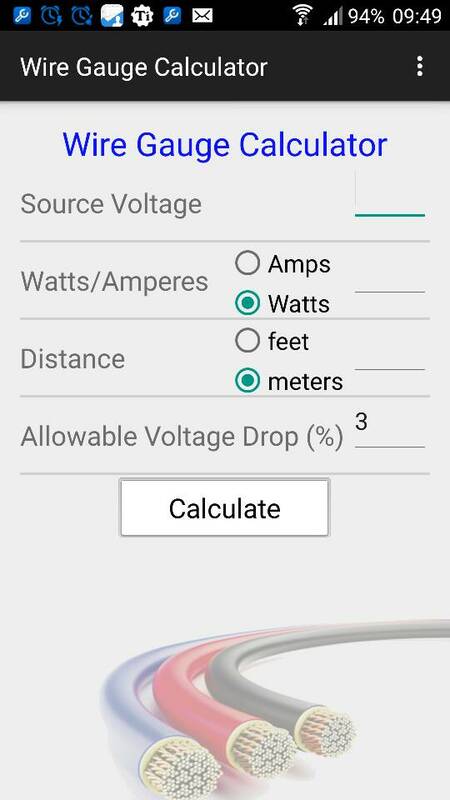 The app is "Wire Gauge Calculator". Screenshot of the app I use for installing the LEDs around the house. 1. Speaker cables from Game won't do. Get better cables. Yes they will make a difference but I can't tell by how much as there are too many variables here. By the way thicker doesn't necessarily mean better. The quality of materials used in the cable is where the biggest advantages can be found. That being said don't expect to find any really thin cables like the ones u have from high end brands either. Get a nice DAC if anything and some entry/mid level audiophile speaker cable of reasonable thickness, or anything similarly priced that people recommended. Then go back to what you were doing before, enjoying listening to music, watching good movies etc. Beware of the snake oil, it tastes amazing but causes blindness. Thanks for the responses it clears up alot when it comes to initial setup! For now ill start looking locally for some good cabling for at least the front speakers and work my way back. I'll probably end up getting a dedicated second hand cd player for now until I improve my setup.